This is general Kud news and speculation. It is not directly related to the translation. 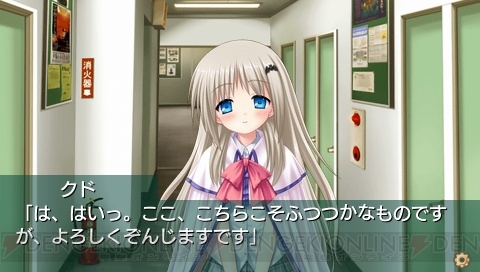 Kud Wafter will be ported to PSP (not Vita)as the tentatively titled “Kud Wafter Conbaateddo Edishon” (yes Kud Engrish) Besides being all-ages this version will include new events and CGs. It also will have many PSP features such as : the ability to move BGM to your Memory Stick and listen to it without the game, a “Memory Disk” function to play the game without the disc, and a screenshot function. I don’t have a PSP but this is quite tempting! Update: Dengeki Online has more visuals, this time a logo with the title romanized (not the hiragana used in the magazine that implied engrish titling) and some screen shots. As said above the engrish title was tentative and magazines tend to be behind so this is probably more accurate. However I suspect KudWaf is going to end up fragmented like Tomoyo After. For Tomoyo the H-edition was first-press only then an expanded consumer port was released. That PS2 port was the definitive version until it was backported as an all-ages memorial edition five years later. The 18+ edition was never reissued. Considering Key is emphasizing all-ages versions of even Kanon and Air I would not be surprised if the same happened to dear Kud. Hopefully Key will reissue Kud PC in a normal (18+) or memorial (all-ages) edition within the next two years before it becomes too rare. I know this sounds glum but this is my prediction based on previous product cycles. I will support any PC edition in print when the patch is released. Normally I wouldn’t like very much them taking out content from the original name, but I’d like to hope that this PSP edition goes out well for them, so they can make (like you said) a third time a 3rd (and even better) PC game (+18) to recover the all the things and include the new things added in the PSP edition. I really hope they don’t make Kud look bad, that’s what I find most important. It’s true, they changed the look we had on Tomoyo very much in “Tomoyo After”, but it’s not so bad, looking at it that she really loves Tomoya way much than we can imagine.